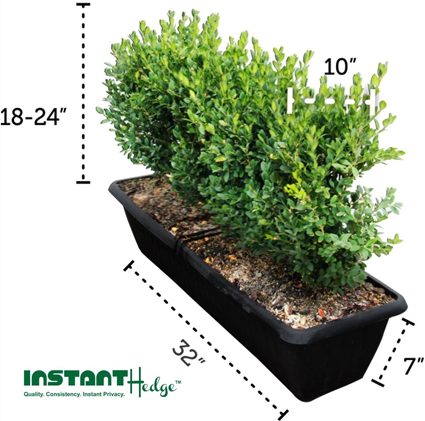 The InstantHedge family of hedges is available in three convenient size options, with multiple packaging choices to suit your needs. Our smallest option, the 18” boxwood hedge, is easy for one person to maneuver alone for a low hedge or knot garden. Our 3-4’ hedges are the perfect mid-size option for creating garden “rooms” or hedges you want to see over. The 5-6’ hedges are unparalleled for instant privacy or a dramatic backdrop for your landscape. Dimensions of a 5-6' InstantHedge growing in the field, ready to harvest. Miles of 5-6' InstantHedges, ready to be harvested from the field. This 6' yew hedge provides instant privacy immediately after installation. 5-6' InstantHedge units ship 3 per pallet in cardboard or cedar, and 4 per pallet in fabric bags. Dimensions of one harvested 5-6' InstantHedge unit in a cardboard box. This 5-6' beech hedge provides privacy to the garden with a view of the surrounding fields. Driveways gain elegance and drama when lined with tall hedges. Peace and quiet in any garden space are easy to achieve with a 5-6' hedge. Deciduous hedges like this beech hedge provide seasonal interest as well as privacy. Line paths and hide fences with 5-6' tall privacy hedges. 5-6' tall English Laurel InstantHedge units harvested and ready to ship. A 5-6' tall crop of English Laurel InstantHedge growing in the field. Dimensions of 3-4' InstantHedges growing in the field. European beech InstantHedge rows, growing at 3-4' tall. Yew is a great choice for keeping at 3-4' tall like in this contemporary garden. 3-4' hedges create an attractive medium border around the grounds at this commercial building. 3-4' hedges provide separation in a landscape design without blocking views. 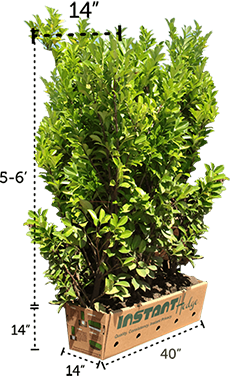 Portuguese laurel is easy to maintain as a 3-4' hedge thanks to its dense growth habit. This dining area is defined yet connected to the rest of the garden by the 3-4' beech hedge. This city park used 3-4' beech hedges to define spaces and provide some privacy and urban green space. 3-4' Beech InstantHedges growing in the field. Three-foot hedge can be shipped on double-racks, fitting 6-8 per pallet. Hicks Yew is one of our most popular 3-4' hedge varieties. Dimensions of a 3-4' InstantHedge unit it a biodegradable cardboard box. Our 18" boxwoods looking lush in the summer. Boxwood InstantHedge units are container-grown and have incredibly healthy root development. Cottage knot gardens are made complete with 18" boxwood borders. 18" InstantHedge Boxwood hedge with dimensions. 18" boxwood hedges are perfect for creating formal knot gardens. 18" boxwood borders provide structure to formal gardens like this. Boxwood hedges are easy to maintain in unique patterns like this maze garden. Formal gardens almost always have a low boxwood hedge. Dimensions of our 18" boxwood hedges shown in their field rows. 18" InstantHedges can be shipped 24 per pallet rack. 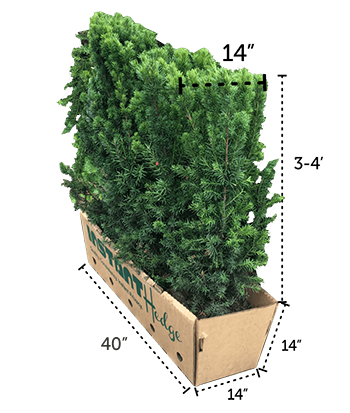 Boxwood hedge units are under 40 lbs each and are easy for one person to lift and maneuver. Our boxwood hedges are uniform and beautiful, ready to create a finished low border in one day!